STORRS, Conn. - The No. 5/4 Boston University men's ice hockey team allowed visiting Connecticut to score four goals on just 20 shots in a 4-0 loss to the Huskies on Saturday evening at Agganis Arena. Location: Agganis Arena - Boston, Mass. 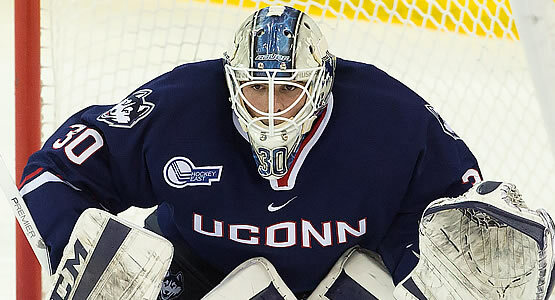 - UConn freshman Adam Huska turned aside all 37 of the Terriers' shots to pick up his first collegiate shutout and allow Connecticut to earn a weekend split with BU. - After neither team was able to score in the first 30 minutes of the game, Karl El-Mir broke the scoreless deadlock at 10:04 of the middle stanza when he wristed a shot past BU netminder Jake Oettinger after Johnny Austin took out Charlie McAvoy while he skating with the puck in his own end. - The visitors doubled their lead before the second intermission at 16:08 of the second when Kasperi Ojantakanen scored off a feed by Benjamin Freeman just as a UConn power play expired. - The Terriers came out of the third-period gate hungry for a goal but the Huskies killed any chance of a momentum switch when David Drake corralled a deflected puck and had his shot from the right circle go off Oettinger's pad and in with 18:12 to play. - Corey Ronan, son of former Terrier Ed Ronan, capped the scoring at 5:44 of the final period when he pounced on a bouncing puck in front of the BU goal. - BU outshot UConn, 37-20, and held a 34-15 advantage at even-strength. - The loss snapped a nine-game home winning streak dating back to Dec. 4 of last season. It was BU's longest home streak since 1997, when the Terriers were playing at Walter Brown Arena. - Oettinger allowed his first goals at Agganis as his home shutout skein to begin his career came to an end at 204:41 on El-Mir's goal. - Freshman Patrick Harper recorded a career-high nine shots on goal. - BU is now 4-2-1 all-time against the Huskies. The Terriers have a quick turnaround as they will host No. 11/10 Harvard in a match-up of crosstown rivals. Game time is 7 p.m. and it will be streamed live at GoTerriers.com/TerrierTV.